The File Manager is where you interact with all of the Files you either bought or downloaded during a game. Different files go in different “Folders” depending on where you got them or what they are. There are lots of different file types however most of what you will Download or buy will either be an Archive, Executable or eBook. Archives can be encrypted which takes in-game time to break depending upon the type of encryption used (if you have the password it’s instant though). When you set an Archive Decrypting it gets moved to the Projects folder and added to the Decryption queue. Decrypting is passive and will gain progress every turn. When an Archive is decrypted (or if it had no encryption) you can “Extract” it. Extracting an Archive will tell you what was inside. You might be able to sell it for money, release it for Notoriety, reverse engineer it for Inspiration or it might be worthless garbage. Archives can also contain any of the other File-Types. Executables can be Installed if there isn’t already a version of it installed in your system. The latest version always takes priority so if you try and install a v1.2 program over a v1.3 then it won’t take. Once installed an Executable is trashed. Executables can be bought from the Marketplace, found in Archives or Compiled from Source code (also found in Archives). Executables allow you to perform actions on Servers such as performing a DDOS attack or pinging an unidentified server to reveal it. Most Executables have a number of uses before the security vulnerability they exploit is fixed – improving the executables version adds extra charges but requires the Source code. Source Code and schematics can be bought on the Marketplace or found in Archives.These can be “Installed” adding a Project to the Projects folder. Software Projects can be Compiled to yield an executable of the appropriate version that can be Installed. Projects can also be “Researched” which has a chance of improving the version number. Research costs an action and is a random chance of success. During the game you will earn “Inspiration” either by reading eBooks, Reverse Engineering, Extracting Archives or through using Boosters. When you Research a Project you can burn Inspiration to increase the chances of success. Books can be “Read” and will provide Inspiration or permanent buffs. Books only provide their bonuses the first time you read them. There are 2 kinds of physical Item in the game. Hardware and Boosters. All Items are located in your “Inventory” screen and can be sold if they have not been consumed. Items being physical goods once purchased will not arrive until the following in-game day. Hardware is installed to one of the slots in your Rig (chosen on the start game screen). Rigs have different slot configurations for different Hardware upgrades. Hardware can be bought on the Marketplace or Fabricated from Schematics in the Projects folder. Once installed Hardware cannot be removed without destroying it. 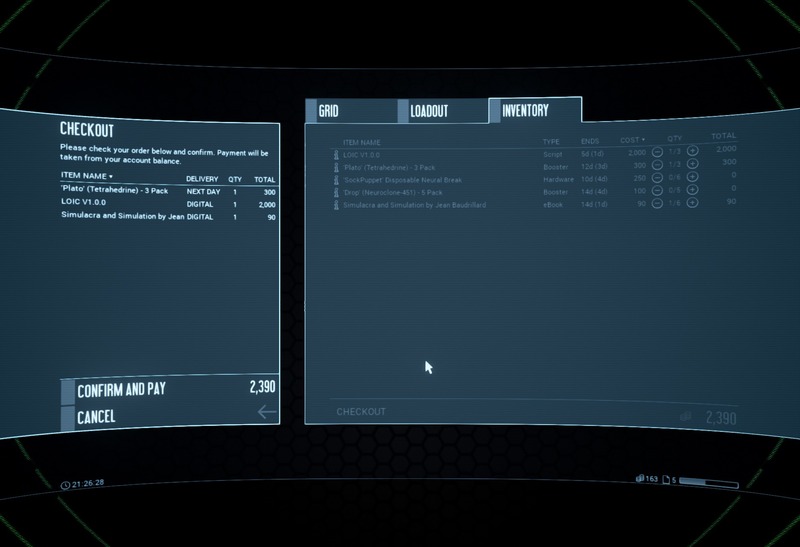 Hardware can be installed from the Inventory screen. Boosters are neuro-chemical implants that inject a cocktail of pharmaceuticals into your neural interface. You can only have one Booster active in a day and prolonged use will build up toxicity which can lead to brain damage. Boosters provide significant buffs and are able to increase how many actions you can take each day, how effective research is and some can even repair brain damage (assuming you manage your toxicity levels). Boosters are used from the Inventory screen.